Features actual film cells from various John Wayne movies! Numbered limited edition measures 20-inches wide x 19-inches tall. 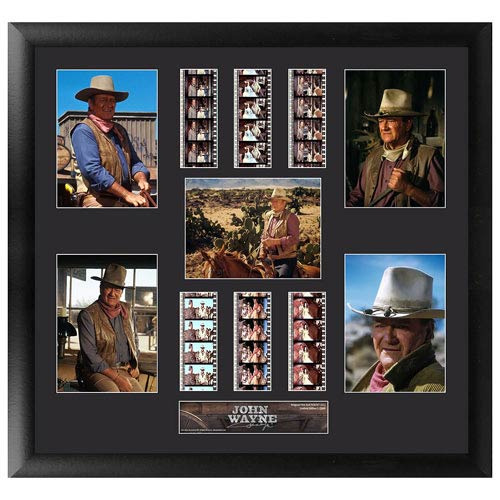 Take home a remarkable John Wayne collectible in this John Wayne Series 1 Montage Film Cell. Framed in black and measuring 20-inches wide x 19-inches tall, it contains 5 images, 6 unique cells of actual film from The Duke's marvelous movies, and a numbered limited edition nameplate. Limited edition of 2,500 pieces. Made in the USA. Each film cell presentation is made with careful attention to detail. It's double matted, placed in a quality frame, and contains an acrylic front and back that allow natural light to enhance the film frames. Each piece of film is hand-cut from reels to provide you with the best possible scenes and to offer a unique and varied product. This is all put together to bring you a fine piece of art that looks great in any room.